Ad Tech (paid media) has been around for quite some time—with advertising on social networks and popular ad platforms like Google AdWords—but it has historically been seen, and treated, as its own category. A big shift that we’ve seen over the last year or so is that Ad Tech and MarTech are gravitating closer and closer together as a response to the demand from the market for connecting these two technologies. Looking at the combination of these two technologies and the continued migration towards a more mobile world, we start seeing opportunities for new types of paid media that help marketers create seamless, end-to-end experiences for their target audiences. This blog post will examine a new type of ad that blends the elements of Mobile Ad Tech and MarTech. Let’s take a look at a new solution—Facebook Lead Ads. A Facebook Lead Ad is a new type of ad unit that Facebook announced in mid September last year that’s designed specifically for the mobile channel. This ad unit allows a marketer to specify a set of questions via a form to capture a person’s information inside of the Facebook mobile app without the person ever having to leave the app. You tap on the subscribe button because you’re interested in receiving the personalized newsletter. Next, you’re presented with a form (inside your Facebook app on your mobile device) that the marketing team has built to capture data on the your interests and communication frequency preferences. The examples below show what this flow looks like. Now, you’re able to choose the content you are interested in hearing about—in this case, it’s Web Personalization—and how frequently you want to hear from the advertiser (once every two weeks). That’s it, with a few quick taps you can submit your details and the company is now able to effectively deliver personalized content to you based on the terms you specified. As you can see with the example above, Facebook Lead Ads allow marketers to seamlessly capture information about a person with just a few taps on their mobile device. When someone engages with a Facebook Lead Ad, they are presented with a form that is pre-populated with information they have already shared with Facebook, such as email address (work or personal as specified by the marketer building the form), phone number, mailing address, etc. This makes the form submission process quick and easy. No more re-directing people to a mobile version of a form on a mobile version of a landing page that requires multiple taps and manual data entry. Instead, the person filling out the form has a seamless experience with the brand with minimal interruption. The best part? Your marketing automation platform can continue the seamless experience once someone has submitted a form. The answers to custom questions, like frequency of communication or specific interests, can be transferred into your marketing automation platform’s database and then used to inform your marketing programs for instantaneous responses and continuous engagement. This shifts the focus from outbound marketing and webpage sign-up forms to mobile inbound inquires, email subscriptions, sign-ups, registrations, and so on. Now, marketers can trigger a sequence of events based on an in-app form fill out. Take the example above. The marketer may want to trigger an immediate email response based on the prospect’s interest. 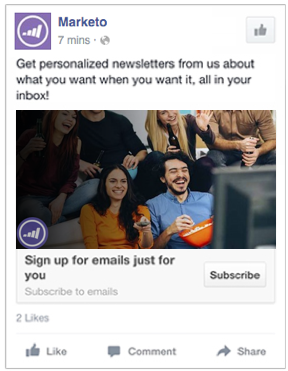 Using the example above, let’s assume Marketo has already set up a nurture track for Web Personalization. 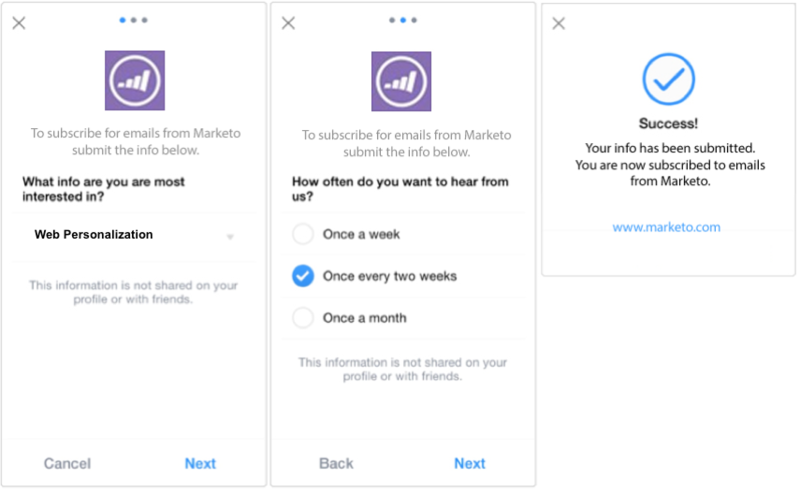 Upon subscribing to Web Personalization content via the Facebook Lead Ad form, Marketo can then add the people who submitted the form to the relevant nurture track in order to continuously deliver specific content the person has requested and engage them based on the frequency that they specified. Together MarTech and Mobile Ad Tech improves a marketer’s ability to offer a more relevant experience to their audience. How are you using Mobile Ad Tech in conjunction with your marketing automation? I’d love to hear about it in the comments below.